Binsar is a true trekking paradise. The front of the BEM depicts the detail contours of the mountainous terrain of the Binsar WLS including villages, estates, view points, water points, trekking routes, distances, and places to stay including home stays and resorts. It also shows the full range of Himalayan peaks visible from Binsar. and wild animals through sketches. 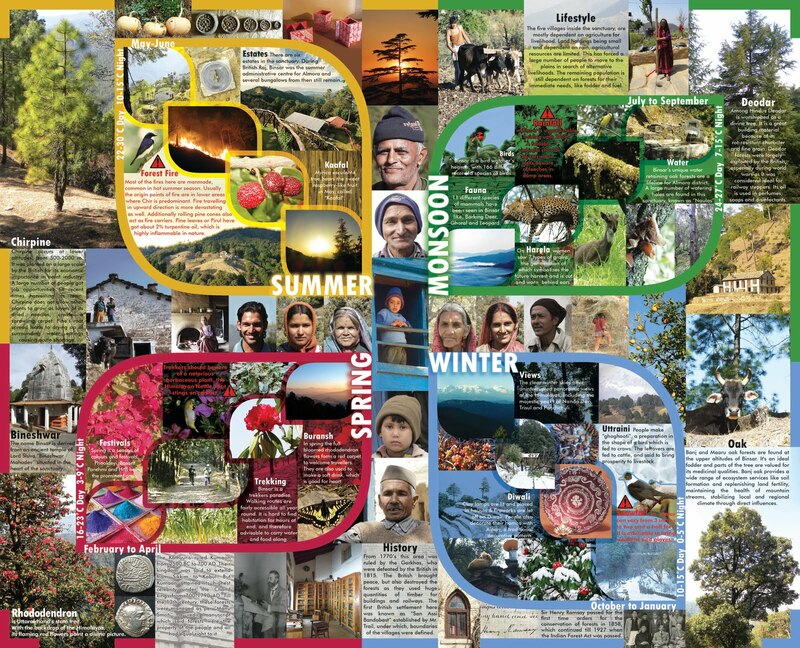 As Binsar is open all year round, the back of the map provides impressions of the four seasons of the WLS through photographs, stories, historical information and practical tips for tourists. 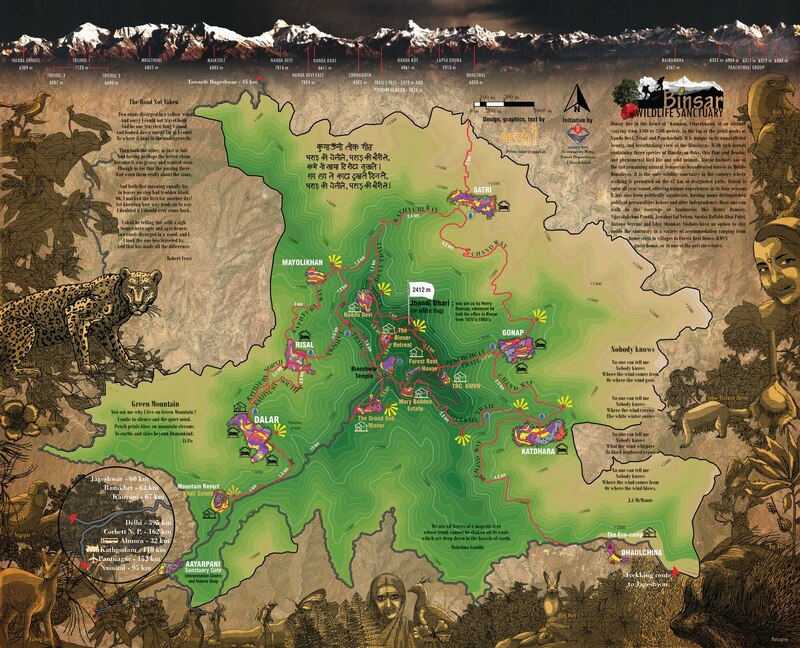 Good quality maps are vital for ecotourism promotion. They provide excellent promotional materials and they spread environmental awareness. This map is the second in the series. The first one was the Chhoti Haldwani Heritage Map (CHHM) on 16th Dec 2010 at Chhoti Haldwani. The Community-based Ecotourism project here has received a major fillip after the publication of the CHHM. 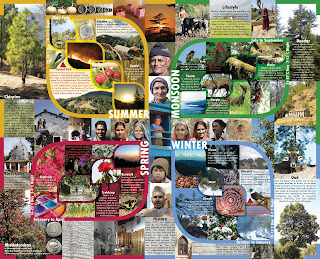 Work is in progress on Ecotourism Map of Uttarakhand, which will be ready before the next tourist season. These innovative maps are funded by the Forest Department at different scales – heritage village level, Protected Area level, State level and landscape level. Binsar Wildlife Sanctuary (WLS) situated close to Almora, a fifteenth century town in Uttarakhand, and commanding spectacular views of Greater Himalayas is truly an ecotourist’s paradise. With rich forests containing three species of Himalayan Oaks, Chir Pine and Deodar, an intact under story of herbaceous vegetation and phenomenal bird life and wild animals, Binsar WLS harbours one of the last remaining natural patches of Temperate Broadleaved Forests in Middle Himalayas. The WLS is the only Protected Area in Uttarakhand that is open round the year for visitors. Binsar WLS annually receives over 27,000 visitors including 800 foreigners. Walking inside the WLS is permitted on the 62 km. of designated trails. Visitors can stay inside WLS in home stays offered as part of Community-based Ecotourism initiatives or at the Forest Rest House run by Forest Department. Or they can explore camps and lodges on private estates. In addition to enjoying Himalayan views, bird watching, trekking and plant study, river rafting can be done in nearby Saryu River and angling at Seraghat or visit the famous Jageshwar temple. Watching Himalayas on moon lit nights during winters is an unforgettable experience! “Village ways” programme under which villagers have established home stays in five villages has received both national and international awards. ‘Eco Camp Binsar’ is highly regarded as a successful eco-lodge. Close to the peak, ‘The Binsar Retreat’ is one of the finest camps in the region. Binsar Forest Rest House is one of the best FRHs of Uttarakhand. And the WLS has many more other home stays and authentic resorts.